Kemp, A. C. 1995. The Hornbills (Order Bucerotiformes). Bird families of the World Series No 1. Oxford University Press, Oxford. Kemp, A. C., and Kemp, M. I. 1980. 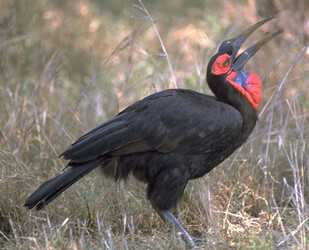 The biology of the southern ground hornbill, Bucorvus leadbeateri (Aves, Bucerotidae). Annals of the Transvaal Museum 32:65-100. Lum, S. and P. Poonswad, eds. 2005. 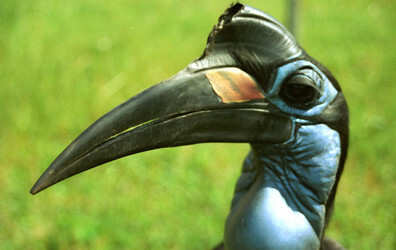 The Ecology of Hornbills: Reproduction and Populations. Pimdee Karnpin, Bangkok. Morrison, K, Daly, B., Burden, D., Engelbrecht, D., Jordan, M., Kemp, A., Kemp, M., Potgieter, C., Turner, A. & Friedmann, Y., eds. 2005. Southern Ground Hornbill (Bucorvus leadbeateri) PHVA. Workshop Report. Conservation Breeding Specialist Group (SSC/IUCN)/ CBSG South Africa, Endangered Wildlife Trust. Bucorvus abyssinicus, Northern Ground Hornbill. DigiMorph. Page: Tree of Life Bucorvidae. Bucorvus. Ground Hornbills. The TEXT of this page is licensed under the Creative Commons Attribution-NonCommercial License - Version 3.0. Note that images and other media featured on this page are each governed by their own license, and they may or may not be available for reuse. Click on an image or a media link to access the media data window, which provides the relevant licensing information. For the general terms and conditions of ToL material reuse and redistribution, please see the Tree of Life Copyright Policies.